If you don’t agree with the correction the IRS made, it’s important that you respond as requested. Respond to the IRS in writing to explain why you disagree. Include any documents and information you wish the IRS to consider, along with the bottom tear-off portion of the notice. Mail the information to the IRS address shown in the lower left corner of the notice. Allow at least 30 days for a response from the IRS. If you feel that you cannot accomplish this on your own, call or email us to set up a consultation to discuss how e can be of assistance. 4. Keep copies of any correspondence with your tax records. 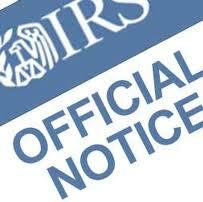 Often our clients don’t understand the correspondence or disagree with the notice from the IRS. We can help! This entry was posted in IRS Letters and tagged IRS Problem Help, IRS Relief, IRS Tax Problems, Tax Audit, Tax Penalty Relief, Tax Problem Solutions. Bookmark the permalink.